Use this information to get an estimate of the production costs for your book. You will have the option to select ebook, print-on-demand, or both. You can submit the following source materials: Word, PDF, or physical book. You can also submit an existing ebook to be turned into a print-on-demand book. When we’ve received all of your enrollment materials, we’ll review the source material (a physical or digital copy of the book that you want to enroll in Back in Print) you provided and will email you an invoice based on the guidelines below. This invoice may also include the $250/title Back in Print services and support fee, the $150/title cover design fee, and a $29/title fee charged by IPG for editorial work in addition to the production costs they charge to create your book files (detailed below). After you’ve sent your payment and approved your book cover design, we’ll send your materials to IPG so they can begin working on your book files. If you supply us with a physical copy of your book, we’ll scan it in-house and create a PDF file of it at no additional cost. Please note that this will require us to cut the spine off of your book, and that we will not be able to return the book to you. And be sure that the pages of the book you send us are clean and legible. The process of converting a scan of the book into an editable text file will result in errors if the software can’t easily determine what characters are on the page. Ebook conversion will take 5–10 business days. Print-file creation will take 7–15 business days. Ebook and print will take 10–15 business days. Below are charts to estimate the costs of converting your book to ebook, print-on-demand, or both. Note that you’ll be provided with an invoice before we proceed with creating your book files or cover, and that you’ll be able to cancel your enrollment application if you decide that the cost is too high or for any other reason. $0.35 per page for books with simple formatting. $0.70 per page for books with complex formatting. If IPG deems the book complex, you will be asked to approve the higher cost before proceeding. 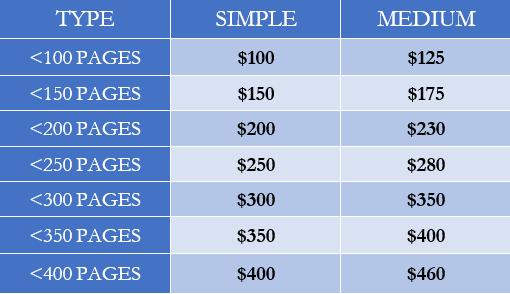 If you would like your book turned into both ebook and print-on-demand editions, the following pricing applies. Note: for digitizing a scanned physical book, IPG requires a charge of up to $0.19/page plus the production costs estimated below. Note: for digitizing a scanned physical book, IPG requires a charge of up to $0.19/page plus the production costs estimated below. Simple: Straight forward text-only books without any design elements such as tables, inline images, lists, blocks of text, diverse font formatting, background colors, endnotes, etc. Medium: Titles containing a maximum of 20% design elements listed above. Complex: Titles containing a maximum of 40% design elements listed above. IPG also has three complex subcategories: high complex, high complex & text assurance, and high complex II. These are not listed in the price tables above. If your book is categorized into one of the three complex categories, IPG will send you a cost estimate upon reviewing your book. The below examples illustrate how production costs are calculated (these do not include the Back in Print services and support fee, cover design fee, or $29 editorial fee). Simple formatted text: You have a 300-page novel with straightforward formatting (a one-page TOC, no design elements besides chapter titles). To make only an ebook, the conversion cost is $105. To make both an ebook and print version, the conversion cost would be in the range of $285 to $342. Medium formatted text: You have a 300-page nonfiction book with up to 20% design elements (e.g., various subheaders with special formatting, 3 tables, and a 100-item index). The conversion cost for ebook production is $226. The conversion cost for both ebook and print files would be in the range of $376 to $433. Complex formatted text: You have a 300-page self-help book with up to 40% design elements (dozens of images that need to be specifically arranged, numerous subheaders and fonts, 5 tables, and a 200-item index). The conversion cost for ebook production is $240. The conversion cost for both ebook and print files would be in the range of $525 to $582. You can have your book edited, revised, or updated using the Revision Request form. For example, you may want to include a new foreword in your book or fix a typo that’s present in your source material. Please note that content you add to your book may increase the complexity and page count and, therefore, the cost of making your book files. IPG charges a $29 fee that covers basic revisions as well as OCR corrections. For substantial or complicated revisions requested after the book files have been created, IPG might require a higher fee of $79 or more per book. Physical books and PDFs need to undergo OCR, or optical character recognition. This is the process by which images (scans of book pages) are converted into editable text files. The Quality of OCR is tied to factors such as the clarity of the source material and the original font used. For example, an error that may come up is the word “clear” in the source material being changed to “dear” in the new book files. To resolve typographical errors introduced by the OCR process, most books will require proofreading that costs $0.07/page. This is performed by IPG when the ebook and POD files are created. Authors will still need to review their ebook and POD files to find any remaining OCR errors and submit request forms to have them revised. These revisions are covered in the $29 basic revision fee that IPG requires. If the OCR is especially poor, IPG may charge a fee up to $79 in place of the $29 fee. If this is the case, you will be informed before any work is done on your book. *The pricing tables above refer to PDFs that have been processed with OCR (optical character recognition) and can be converted into Word files. Flat image PDFs, which would require OCR, cost an additional 30%.